As the 21st feature and first female-led film of the Marvel Cinematic Universe, Captain Marvel’s subtext is an essential part of its main text. Under the direction of Anna Boden and Ryan Fleck, it is a story seen through a feminist lens, confronting the conventional expectations of superheroes in a male-centric universe — of the whopping 24 characters featured on Avengers: Infinity War’s poster, just seven were women. 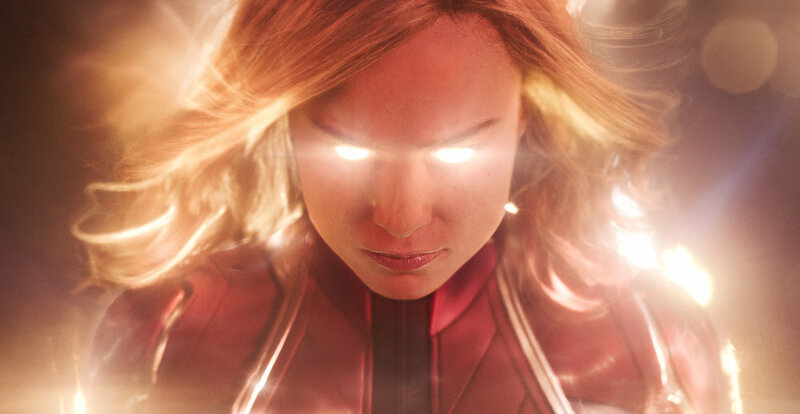 Brie Larson plays Captain Marvel — though she is never called that moniker during the movie — the supremely powerful hero of the film. Her hair is often mussed and gets in her face. She’s emotional, expressing anger and frustration often. In one wonderful moment, an enemy roars at her, and she roars right back at him. She’s goofy at times, a deadpan snarker at others. For much of the film, Larson’s character is known as Vers, a member of the alien Kree race. By her description, Vers’ people are a race of “noble warrior heroes,” up against the threat of the Skrull race, goblin-like beings who can shapeshift into anything they’ve seen. Like body-snatchers, these aliens could become anybody and hide amid an unsuspecting race. Unlike Invasion of the Body Snatchers, Captain Marvel’s Skrull narrative contains no allusions to the threat of communism, though its thematic nature — concerning fears of a foreign invasion — is not too far off. Captain Marvel is not the first of the Marvel films to feature political or social messaging — Iron Man addressed war profiteering; the two recent Captain America movies touched on some unfulfilled ideas about governmental oversight; Black Panther took a strong line on colonialism — but it is, nevertheless, a poignant one. Vers had a life on Earth before joining the Kree, and her memories are full of misogynist remarks, the jabs of men who try to keep the protagonist — then known as Carol Danvers — at the bottom of the totem pole. Carol’s tenacious desire to keep fighting and to get back up is part of what endears her to her audience. The fighting and action leave something to be desired. While Marvel movies like Captain America: The Winter Soldier and the two most recent Avengers entries have featured interesting variations on the punching and kicking that many of the superheroes depend on, Captain Marvel offers fairly conventional scenes of fighting, especially in a sequence jarringly scored by No Doubt's “Just a Girl.” Carol has — in the true meaning of the word — awesome powers, but there is still plenty of room for her to let them loose in an exciting way. Captain Marvel is its most successful outside of the action, as it builds upon the foundations of meaningful relationships. There's the connection between Carol and Maria Rambeau, friends from their days with the U.S. Air Force. It can be tiresome listening to a character repeatedly stating that they don't know who they are — Vers struggles with her half-submerged memories of being Carol, not fully remembering Maria — but the support and love between the two characters feels genuine. Carol also strikes up a bantering, buddy-cop relationship with Nick Fury, seen in previous Marvel films as the head of secret intelligence agency S.H.I.E.L.D. Digitally de-aged for the ‘90s-set movie — surprisingly well — Fury approaches the appearance of two different alien species on Earth with a healthy skepticism and a quick wit. The back-and-forth between the two determined characters makes for a fun ride. That ride is also heightened by a great score from Pinar Toprak, the first female composer for an MCU film. Recent Marvel films like Thor: Ragnarok, Black Panther and Doctor Strange have featured scores that leave behind the norm of bombastic, but forgettable film music, opting for more experimental works instead. While it is not a top-tier Marvel film the likes of Captain America: The Winter Soldier, Thor: Ragnarok, The Avengers, Black Panther or Spider-Man: Homecoming, Captain Marvel is one of the better releases in the ongoing series. There are sweet references to Stan Lee and plenty of moments that offer small smiles or laughs due to the ‘90s setting or the appearances of a cat named Goose, which may or may not be an alien called a Flerken, but Captain Marvel should be viewed and commended for introducing audiences to Carol. In Carol, audiences of all walks have a hero who's not perfect and she knows it, but who keeps getting back up. At times, she's ridiculous, and at others, she's acting as a super-powerful defender. It's a joy to watch Carol, and her upcoming role in Avengers: Endgame is likely to be much more valuable with the emotional foundation of her debut, especially as the surviving heroes will look to her to help them get up and keep fighting. Captain Marvel created the perfect character to do just that.